This site allows you to search and browse over 65 years of reporting from the first edition in 1948, when the University was still known as King's College. We have created this as a resource for current students, alumni, family of alumni, and anyone interested in seeing how our University changed in a changing world. We encourage everyone to explore, comment, and share memories with friends past and present. 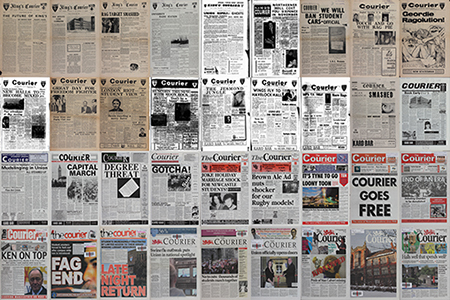 To view current news from The Courier (tomorrow’s history today!) visit The Courier Online. You can explore The Courier Archive by searching for any words in the search bar at the top. Try searching for the names of friends, favourite lecturers, halls of residence, bands you saw…whatever you remember from your time here! Alternatively, you can click on browse the archive at the top of this page and filter by a particular date range. Use this feature to read issues from your time here, when a relative was with us, or see how the student voice responded to a particular global event. For a more tailored visit, Register then Login to the site to comment on particular issues or bookmark them for later. Want to leave a message about the archive as a whole? Once registered, click on contribute to do so and help us in our mission to locate and add missing issues. Finally, have a question? contact us and we'll do our best to help. Copyright 2019 Designed and developed by Digital Library Services.